3. sprays the coagulant on the surface inside the serum seperation tube. 1.We have best production capability ,best quality control, Best Service . C, and do best to ensure that every one will be good condition before shipment. Jiangxi Hongda Medical Equipment Group Ltd.
Shandong Harmowell Trade Co., Ltd.
Cangzhou Yongkang Medical Devices Co., Ltd.
Suzhou Hualun Medical Appliance Co., Ltd.
Suzhou Coming Chengye Medical Technology Co., Ltd.
After blood centrifugation, the specimen can be separated into serum, separation gel and blood corpuscle. When blood was collected to serum separation tube, we should immediately invert the tube gently for 3-5 times. And then we put the tube directly into the automatic biochemical analyzer to carry our biochemical test. Wuxi Qitian Medical Technology Co., Ltd.
B: Protection of your sales area, ideas of design and all your private information. Our products have won praise from customers worldwide. Besides,all of our products have been strictly inspected before shipment. Liuyang Sanli Medical Technology Development Co., Ltd.
Ningbo Hi-Tech Unicmed Imp.&Exp. Co., Ltd. 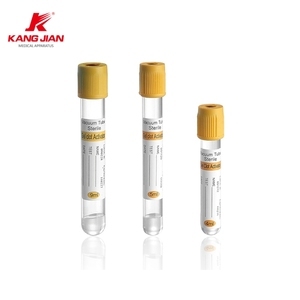 Vacuum Blood Collection Tube Gel&Clot Activator Serum Tube (Glass/PET) with Yellow Top Style NO: UM070701/GCA Classification : Serum Tube Name : Gel & Clot Activator Tube Specification : Gel & Clot Activator &phi; 13mm x 75mm / 100mm &phi; 16mm x 100mm Material : Glass / Plastic Color : Yellow Packaging & Shipping Ningbo Unicmed specializes in supplying high quality medical & laboratory products from China to all parts of the world. Our products lines include:Disposable & Reusable for Medical, Surgical, Laboratory& Emergency. Our customer base includes Europe, North America, South America, Middle East, Southeast Asia and Africa. Please feel free to call us at any time if there is any question. Pls feel free to inquire me if you have any question. it is my pleasure to help you solve the question when we meet at the way of cooperation. 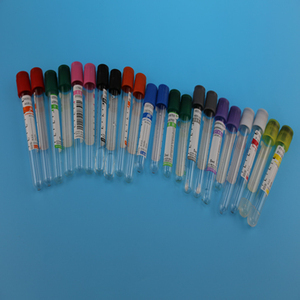 Professional Blood collection tube with CE/ISO Certificate Blood collection tubes are made of glass or pet tubes and color coded according to the appropriate additive and international standard. 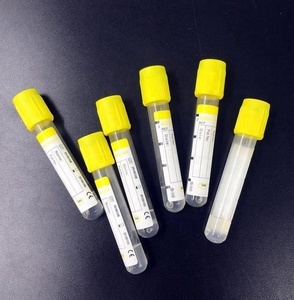 Each tube has its own vacuum state for collection of blood with proper quantity and marked on lable for blood collection and additives inside of the tube. It offers a comprehensive protection for blood cell, especially for protecting the blood platelet, so that it can effectively stop the gathering of blood platelet and makes the form and volume of blood cell uninfluenced within a long time. There uniformly sprays the coagulant on the surface inside the tube, which will greatly shorten the clotting time. Serum collection efficiency is improved and high-quality serum will be obtained, thus it comes to more authentic testing result. With years of export experience along with excellent quality, advanced services and competitive prices, Kingnod has won numerous customers' trust and support. 1.We have best production capability ,best quality control, Best Service . Nowadays it is regarded as a leader in the field of disposable medical wares. Until now it has five big series of items, but more than 300 types of products. Vacuum Blood Collection Tubes 1. Plain (no additive, serum) tube (Red cap); 2. Clot activator (Pro-coagulation) tube(Orange cap); 3. 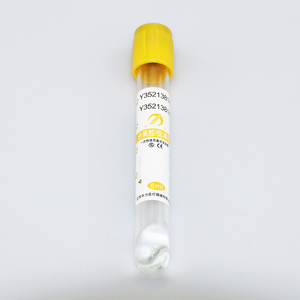 Gel clot activator (SST) tube(Yellow cap); 4. Glucose (sodium fluoride, oxalate) tube (Grey cap); 5. Sodium Citrate tube (1:9) (Blue cap); 6. Sodium (Lithium)Heparin tubes (Green cap); 7. EDTA K2 (K3, Na2) tube(Lavender cap); 8. ESR tube (1:4)(Black cap). 9. 1.28ml ESR tube Glass material(Black cap). We have got ISO 13485 & CE certification of the vacuum blood collection tube Tips: 1. Storage temperature: 4-25&deg;c 2. Centrifuge for 5-10 minutes after blood coagulation 3. Discard it after using More about our Vacuum Blood Collection Tube Type Color Code Additive Plain Tube RED With no additive Serum Tube RED Clot Activator EDTA Tube PURPLE EDTA K3 EDTA Tube PURPLE EDTA K2 Heparin Sodium Tube GREEN Heparin Sodium Heparin Lithium Tube GREEN Heparin Lithium PT Tube BLUE 3.2% Sodium Citrate Citrate Tube BLACK 3.8% Sodium Citrate Glucose Tube GREY Sodium Fluoride/Potassium Oxalate SST Tube YELLOW Gel+Clot Activator Packaging Our customers Contact person:Maggie Please contact me at any Time! Hangzhou Nanaimo Trading Co., Ltd.
1.Q:Are you a factory or trading company9 A: We are a factory, we have rich experience of manufacturing for more than 10 years. 2.Q:Where is your factory located9 How can i visit there9 A: Our factory is located in Yuyao city,Zhejiang Province,China. We have inspector in different post, and there are three inspectors before packing to get best quality products. Beijing Hanbaihan Medical Devices Co., Ltd.
Shanghai Mekon Medical Devices Co., Ltd.
Suzhou Lingyan Medical Technology Co., Ltd.
SUN PLASTIC & MEDICAL MATERIALS INDUSTRIES CO. LTD.
Specification Evacuated, exact quantity of blood is collected. Non toxic ,pyrogen free , EO sterilized and transparent. Disposable and crack resistance Compatible with all common analyser systems. 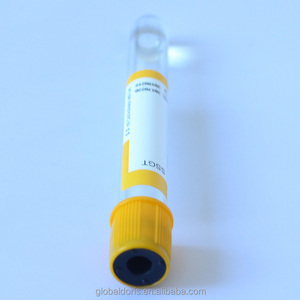 Alibaba.com offers 2,947 gel & clot activator blood collection tube products. About 3% of these are injection & puncture instrument, 3% are pipe,drainage tubes & containers, and 1% are general medical supplies. A wide variety of gel & clot activator blood collection tube options are available to you, such as free samples. There are 2,874 gel & clot activator blood collection tube suppliers, mainly located in Asia. 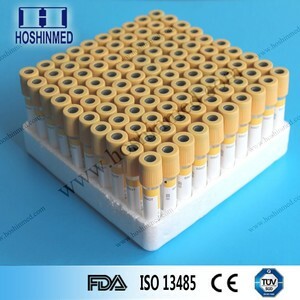 The top supplying countries are China (Mainland), Turkey, and Jordan, which supply 99%, 1%, and 1% of gel & clot activator blood collection tube respectively. 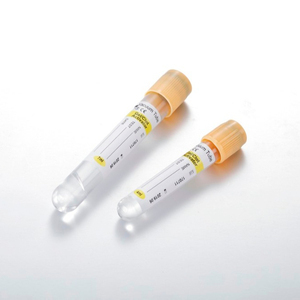 Gel & clot activator blood collection tube products are most popular in Domestic Market, Eastern Asia, and South America. You can ensure product safety by selecting from certified suppliers, including 2,463 with ISO9001, 379 with ISO13485, and 126 with Other certification.